Everything under the sun is happening in China. “Open up your perspective: the best of Chinese farmers’ wisdom” (my loose translation) shows us some of the DIY projects taken on by those deemed “farmers” (农民) in the current Chinese social system. 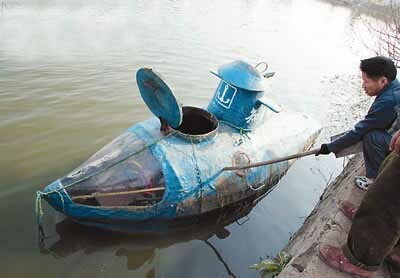 The car drives on land and in water; the submarine is one of a series of subs built by a 67 year old farmer from a village near Wuhan, China. Make sure not to miss Du Wenda’s famous flying saucer, which was taken to the Venice Biennale as an art exhibit by Cai Guoqiang last year…. Flagged as a top photo pick on the Bulletin Board Service (BBS) site of one of China’s largest portals, Sina.com. ◆ Lyn Jeffery is a cultural anthropologist and researcher at the Institute for the Future, a nonprofit group in Palo Alto, California. She studies new experiences enabled by connective technologies. These are great, homemade DIY vehicles from Chinese farmers – the sub was made by a 67 year old farmer from a village near Wuhan, China. [via] Link. Related: MADE ON EARTH – Link…. haha that’s awesome. I can definitely see this happening. 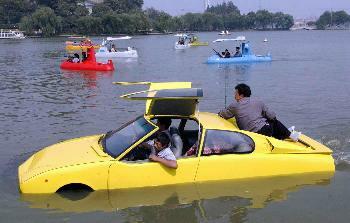 When I was living in Beijing we always so a lot of modified Beijing jeeps and motor bikes with crazy side cars. Nice Post! Nice inventions… I placed your link om my weblog.. Thanks and keep up the good work..! got it, so cool about introduce our’s wisdom farmer to foreigner. 88 Bar is a group blog about technology, media and design in the Greater China region. More about us. Jason Li is a designer, illustrator and consultant currently based in Hong Kong. Once upon a time, he studied engineering and ran a news site about fan translations of video games. Tricia Wang observes how technology makes us human. Her ethnographic research follows youth and migrants as they process information and desire, remaking cities and rural areas. Jin Ge aka Jingle is a writer, documentary filmmaker, and NGO organizer based in Shanghai. Jin does sociological research and produces multi-media content on the subjects of Internet subcultures and grass-root organizations in China. He is currently a senior design researcher at IDEO. An Xiao Mina is a design strategist, new media artist and digital community builder in the Pearl River Delta. She uses technology to build and empower communities through design and artistic expression. Graham Webster is a Beijing-based writer and analyst working at the intersection of politics, history, and information technology in China and East Asia. He believes technology and information design can reveal some of what what wonkdom can’t. Christina Xu is an observer and organizer of communities, both online and off-. She is particularly interested in youth subcultures, cultural translation & syncretism, and user reappropriations of technology. Lyn Jeffery is a cultural anthropologist and researcher at the Institute for the Future, a nonprofit group in Palo Alto, California. She studies new experiences enabled by connective technologies. Copyright 88-bar.com. All rights reserved unless otherwise stated.